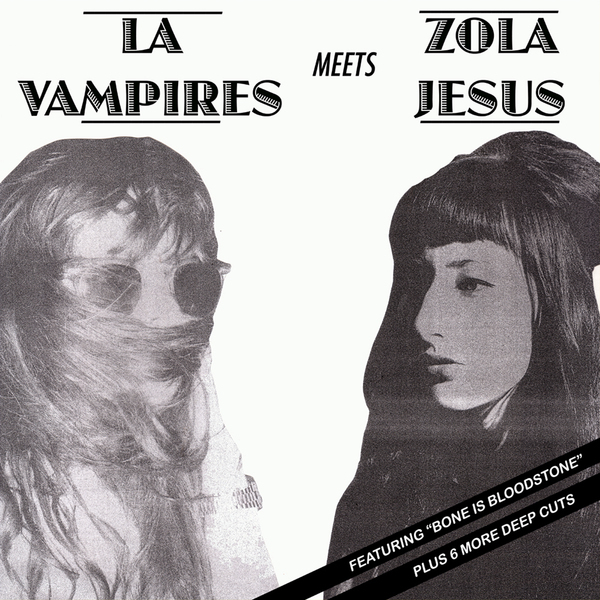 Ghostly goings on from gothic psych queen Zola Jesus and kindred spirit LA Vampires (the current guise of Amanda Brown from Pocahaunted), who collaborate across this killer new mini album. 'Bone Is Bloodstone' rumbles into motion with those familiarly smudged out, indecipherable vocals and evaporating drum machines but there's a heavy bass groove and some ghoulish melodic developments set to balance out any of the more noxiously no-fi elements . In a more reflective mood, 'In The Desert' momentarily extinguishes the low end and stirs up a shimmering expanse of freetime wah-wah chords and droning voices. An altogether more percussive prospect, 'Searching' hints at Pocahaunted's latter-day output, firing up a junkyard dub rhythm, and this idea gets stretched out to booming sub-funk proportions in time for closer 'No No No', which you can just about discern as covering the Dawn Penn classic. Seriously seriously essential wares - very highly recommended.